Nails: A treat for the Hands & Feet. Everybody benefits from a Manicure and Pedicure treatment. Regular Manicure and Pedicure treatment is deeply relaxing and will maintain good nails and healthy skin. 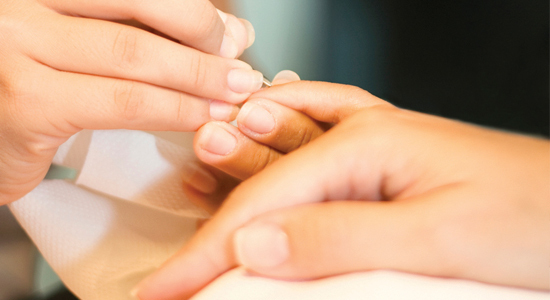 Manicure: Treat your hard working hands to this hand treatment that will leave your hands soft smooth and supple. Consists of file, cuticle work, exfoliation, hand massage finished with an application of polish. Pedicure: A real treat for those tired, achy feet promoting circulation to the feet and legs. File, cuticle work, exfoliation followed by foot and leg massage and an application of polish. File and Polish: Your choice of colour or French. Paraffin Wax Hands or Feet: The paraffin softens and moisturises which is extremely hydrating as well as relaxing. A popular treatment in the winter due to the warming effect. Helps ease aches and pain, stiff joints, nourishes and replenish dry skin. Hot Stone Hand and Foot treatment: An exfoliation followed by a soothing warm massage using Hot Basalt Stones. Relaxes areas of tension whilst calming the nerves.